In support of its first appearance on the Bill in November at the House of Commons Standing Committee on Public Safety and National Security (SECU), the Government of Canada prepared a briefing book detailing its positions on the proposed CSE Act. Bill C-59 was referred to SECU immediately following its introduction in the House of Commons for a comprehensive review of the merits and flaws of the bill and to amend the legislation as it sees fit. We were provided with a lightly-redacted copy of that briefing book by the Government of Canada, which is available here. In this post, we evaluate the Government’s explanation of some of the more problematic elements of Bill C-59 in its briefing notes. Our comments regarding the Government’s briefing notes draw from the joint report published in December 2017 by the Citizen Lab and CIPPIC. We ultimately conclude that while the government’s briefing material provides insight into some of the ways that the CSE might act following the passage of the CSE Act, the material itself does not resolve our concerns with the CSE Act. Figure 1: Publicly Available Information Exception from Government of Canada’s briefing book detailing its positions on the proposed CSE Act. We agree that there are unlikely to be privacy concerns with the Establishment reviewing intelligence reports, reading blog posts, learning about mathematics, or searching for corporate contact information on public websites. We take no issue with the Establishment having such abilities and believe such conduct can be exempted from the CSE’s general prohibition on directing its activities at Canadians. Unfortunately, these innocuous examples are far from the full extent of what the CSE can collect about Canadians under the “publicly available information” exception. Since, according to their brief, the CSE believes this kind of problematic conduct should be off limits, they should have no problem wholeheartedly supporting our recommended amendment to the CSE Act which would preclude it. While we are reassured to hear that they do not currently plan to engage in these problematic forms of surveillance, there is nothing in the law that would stop them from changing their mind at a later point. Hopefully we can all agree that this is an easy fix. Past revelations of the CSE’s activities included realizations that the Establishment has deployed a global sensor network, cover-named EONBLUE, which analyzes vast quantities of information that is directed at the Government of Canada’s infrastructure as well as information which transits the global information infrastructure. This proposal may expand the CSE’s ability to further deploy its sensor network which, in addition to passively monitoring for threats is also intended to interdict and degrade possible threats by manipulating communications. There is a significant risk that such activities both may inadvertently target legitimate communications made by Canadians, persons in Canada, and residents and citizens of foreign countries. Moreover, such activities constitute mass surveillance of communications infrastructure and, thus, an explicit approval for the CSE to engage in highly controversial and rights-infringing activities. 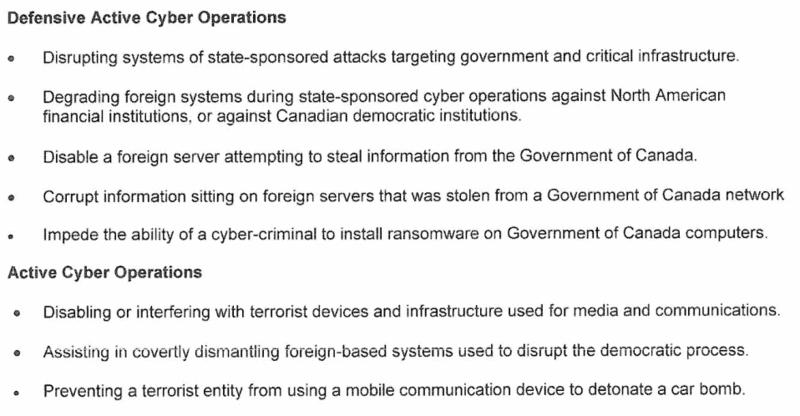 Figure 2: Defensive Active Cyber Operations and Active Cyber Operations from Government of Canada’s briefing book detailing its positions on the proposed CSE Act. It is extremely challenging for even the best-placed agencies and groups to positively identify who is responsible for online attacks in after-action analysis, let alone in real time as an attack is occurring. Moreover, while the talking point refers to ‘state-sponsored’ operations, there is no requirement in the legislation for a response to only take place when a state actor is believed responsible: individuals, organizations, and any other groups which act detrimentally to Canada’s international affairs, defence, or security can be targeted under defensive cyber operations. The proposed CSE Act would let the CSE, as they suggest in their example, disable infrastructure with the dual consent of the Minister overseeing the CSE and the Minister of Foreign Affairs under the “active” cyber operations aspect of the mandate. However, active cyber operations run the serious risk of disrupting the services which are used by innocent persons. It is essential to realize that terrorists use the same infrastructure as everyday Canadians: they, like us, will use WhatsApp, Signal, PGP, and other privacy- and security-enhancing tools. As such, it is imperative that additional steps be put in place to protect Canadians from having their Charter-protected rights infringed upon, and to ensure that Canada does not violate its human rights commitments. At a minimum, this should include requiring the Intelligence Commissioner to approve all active cyber operations and for that Commissioner’s decisions concerning their approval or refusal to be issued as publicly as possible to invite public scrutiny of the legal rationales for approvals or denials. The “global information infrastructure” does not in any meaningful way conform to territorial boundaries. Refraining from “directing” cyber operations activities at Canadians or people in Canada doesn’t stop the CSE’s activities from potentially having significant collateral impacts on their rights. In the cyber operations context, under the proposed legislation the CSE could receive authorization to disrupt and interfere with communications technologies—like messaging apps and anonymity software—that are used globally, including by Canadians and people in Canada. Activities like mass denial of service attacks, or modifying the contents of a newspaper’s website, will often inherently involve a violation of a Charter-protected right. Such rights include the freedom of expression and the corresponding right to receive and impart information. Collateral impacts on privacy rights—as a result of interference with, say, encryption and anonymity tools—may also result depending on how the CSE exercises these powers.The CSE Act doesn’t meaningfully account for this impact, and doesn’t provide appropriate oversight given the risks. As a general note, it is important to recognize that the international norms surrounding state-sponsored hacking are in flux and far from settled. By passing Bill C-59 in its current form, Canada would be normalizing conduct that remains extremely controversial. We are not obligated to engage in reckless, unchecked, state-sponsored hacking or other kinds of problematic conduct just because authoritarian regimes do it, or for that matter just because our allies do so. Instead, we should be moving towards international prohibitions on hacking and joint enforcement, not escalation and legitimization. We also have to think about the economic impacts — CSE acquisition of malware, spyware, and hacking tools is likely to help legitimize a market predicated on undermining and subverting, rather than strengthening, the security of the global information infrastructure. Those tools, as we know, don’t stay in the hands of democratic governments, but rather also end up in the hands of authoritarian regimes and criminal organizations. The same types of technologies are also even trickling into consumer markets and are being exploited for everything from domestic violence to extortion. Some of the positions taken by the Government of Canada in the document—such as regarding limits on publicly available information—are reassuring. Unfortunately, however, there is a vast difference between how the CSE publicly describes its intended use of these powers, and ways they could be used (and abused) in the future. For a detailed analysis and critique of the proposed legislation, including over 50 recommendations, see our full report. 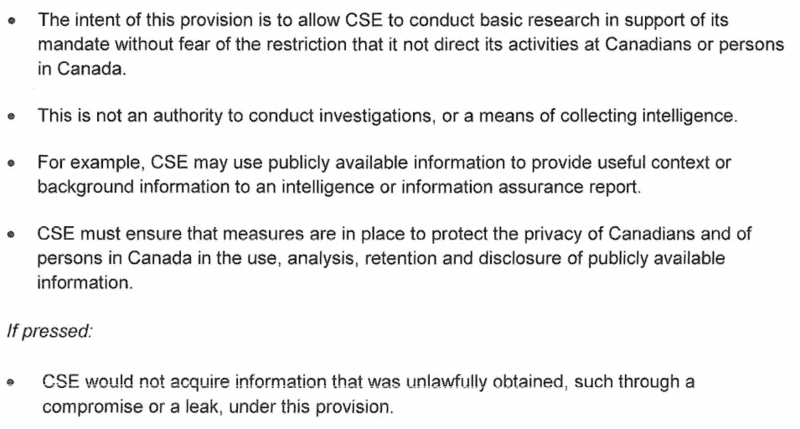 Unless the proposed CSE Act section pertaining to publicly available information is amended, our concerns remain. The same is true of the other examples raised and which we respond to, above: the government has chosen to selectively present a series of relatively innocuous examples and to highlight some of the least intrusive ways that the new powers might be used. But even these uses include the prospect of interfering with the communications tools used by Canadians every day, disrupting legitimate journalistic activities, and broadening the scope of the CSE’s mass surveillance activities. Does this document change our initial findings from December 2017? Generally, no. While it provides insight into some of the ways the CSE might act following the passage of the CSE Act, it does not alleviate our concerns.